If students and teachers assignments are updated in VCAT via the VCAT Import using your student information system assignments, new students do NOT need to be manually entered in VCAT. They should be added and assigned in your student information system, and will be updated in VCAT when the Import is run. Before manually adding a student, it is very important to verify that the student doesn't already exist in VCAT to avoid creating duplicates. If the student does exist, you only need to edit his account. If the student is not found, you will need to create a new student account. It is important to select All students to have access to all the students in VCAT, regardless of what year they were assigned. 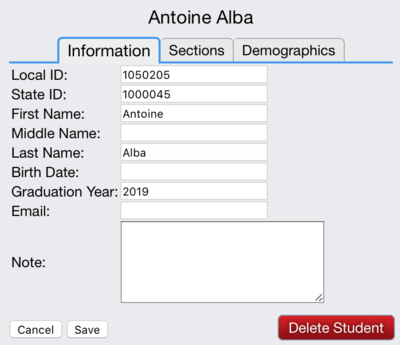 • The student may have a different spelling of his name so typing only part of the last name or part of the first name in the Name or ID field of the filter bar will help working around that. If the student is listed, click on the Edit button in front of his name to update his account. 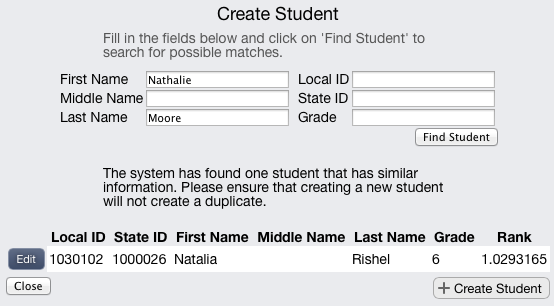 If the student is not found, you will need to create a new student account. • Click on Find Student. • If the student you are interested in is listed in the possible matches, click on the Edit button in front of his row and update his account. • If the student you are looking for is not listed, click on the + Create Student button. • Type in the student's Local ID, State ID (if available), Graduation Year, and any notes you wish to include. The First Name and Last Name fields should already be filled in. 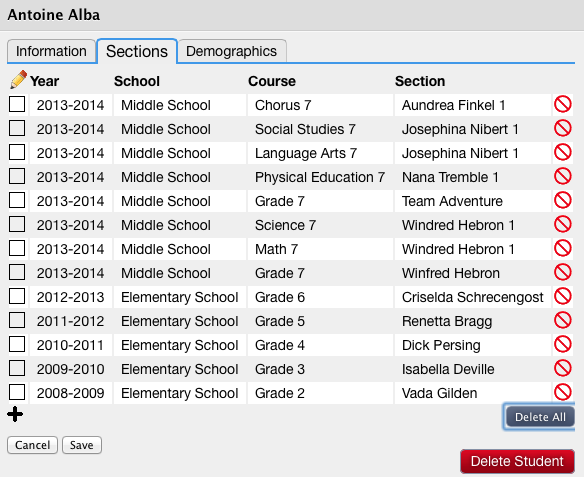 • Go to the Sections tab to assign courses and sections to the student. 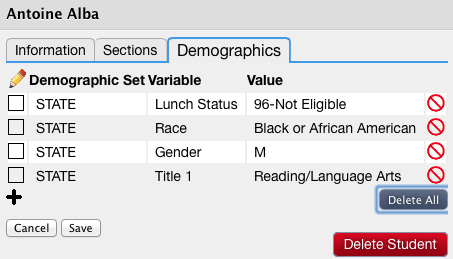 • Go to the Demographics tab to assign demographics to the student. • Click Save to save changes and exit the student account. • Click Cancel to simply exit the student account. THIS WILL NOT SAVE YOUR CHANGES, THEREFORE IT WILL NOT CREATE THE NEW STUDENT. There are three sections in a student account: Information, Sections, and Demographics. You can travel from one section to another by just clicking on the tabs (Information, Sections, Demographics). If you make changes under multiple tabs, you do not need to Save under each one but at least once before exiting that student account. Even though a Delete button is visible, do NOT delete any student yourself. If for some reason a student must be deleted (e.g. duplicate), please contact us at support@vcat.us with the details and we will gladly take care of it for you. If students assignments are updated in VCAT via the VCAT Import using your student information system assignments, your SIS is your primary source of information and any student information should be edited in your SIS. The information will be updated in VCAT when the Import is run. The Local ID, First and Last Name are required fields. The system uses the Grade level the student is in to determine the Year of Graduation. The Note field is useful to manually keep track of any information you may feel is important (e.g. last name prior to adoption, State ID change, date student moved or transferred,...). Click Save to save changes and exit the student account. Click Cancel to simply exit the student account. If students assignments are updated in VCAT via the VCAT Import using your student information system assignments, students should be added and assigned in your student information system, and will be updated in VCAT when the Import is run. The Sections tab includes all the courses and sections the student is currently assigned to or has ever been assigned to in previous years. Click on + to add a new assignment. Select the year, school, course, and section. Click in the box (in column under the pencil) in front of an assignment row if you wish to edit. This includes all the demographics the student is currently assigned to or has ever been assigned to in previous years. If students assignments AND demographics are updated in VCAT via the VCAT Import using your student information system assignments, students demographics should be edited in your student information system, and will be updated in VCAT when the Import is run. Click on + to add a new demographic row. Select the Demographic Set, the Demographic Variable, and the Demographic Value. Click in the box (in column under the pencil) in front of a demographic row if you wish to edit. Click on the red circle at the end of a demographic row if you wish to remove/delete that demographic assignment. VCAT allows you to export a student list in different formats: PDF, Excel, CSV (comma separated values), or Text (tab delimited text). • Click on Export (top right corner), and the format you want. By default, the list includes Local ID, State ID, Last Name, First Name, Grade, and Sections. For more details on the Sections, check the Section Details box before clicking Export and selecting the format. This page was last modified on 16 January 2018, at 20:03. This page has been accessed 36,956 times.